The start of Fall marks the time of year that most people put on the most weight. In fact an average of 4.5 pounds of weight between now and the first of the year. With Halloween, Thanksgiving and Christmas around the corner, the temptation is everywhere. We are all spread a little thin, and relying on fast food or not having the time to cook at home is a challenge. I would like to make it through the season maintaining, if not losing a few pounds this year. My new found interest in baking probably won’t help the situation. I need to make sure to spread the love when I have a tray of baked goods and not retire to my bed to eat the entire batch myself. I mentioned last week how much I am in love with The Great British Bake Off. Watching has made me realize how much room there is to grow in my baking and pastry skills. Bread is something I struggle with, historically it’s been kind of hit-and-miss in that department with as many failures as successes. The precision and accuracy required for baking work against my tendency to wing it in the kitchen. I am trying to slow down and enjoy the process, take my time and learn something new. Prepping ingredients ahead and having a big bowl of roasted veggies, beans, and grains makes dinner a no-brainer. It only takes an hour or so on the weekend to prep enough for several lunches, and dinners so double this recipe, and you won’t have an excuse to eat chips and guacamole for dinner like I did the other day. I love bowls, I’ve made a lot of them, like this one, and this one. I love throwing a bunch of vegetables together, topping it with a flavorful sauce and dinners served. 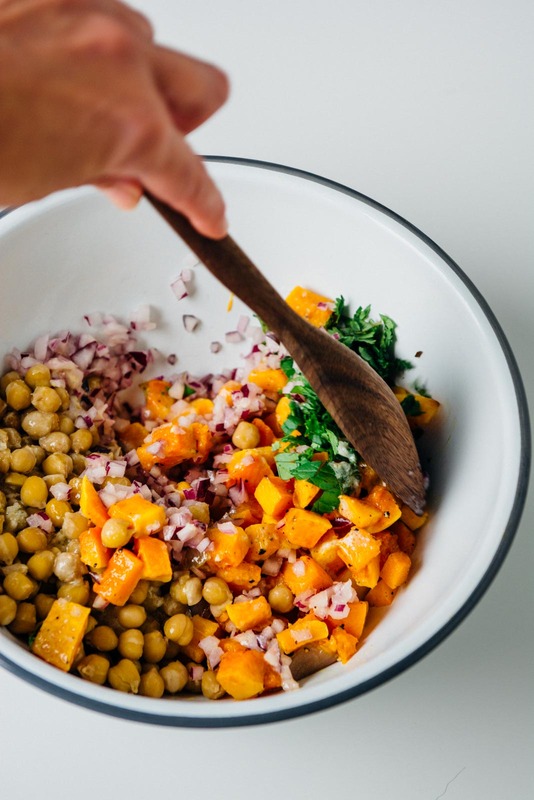 This butternut squash and chickpea autumn glow bowl are one of my very favorite recipes of all time, and I can’t believe I’ve never shared it with you! 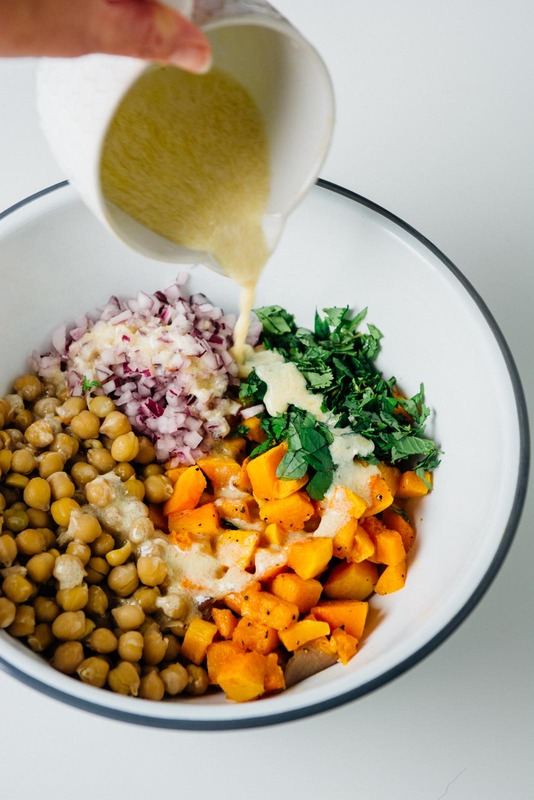 Glow bowls, buddha bowls, bliss bowls all refer to vegetable and grain bowls that have a good balance of carbohydrates, healthy fats and antioxidant rich foods. This bowl is great hot or cold and keeps in the fridge for 3-4 days. I prepped my chickpeas from scratch and offer a recipe for them but feel free to substitute with a can of chickpeas instead. The dressing is a mixture of miso, tahini, and garlic and is great with a kale salad or a topping for any roasted vegetables. I served the mixture on top of some couscous because it takes five minutes to prepare but quinoa, farro or brown rice are all good options as a base. To be honest, I usually eat it without the addition of any grains but it’s delicious either way. If you give this recipe a try, I’d love to hear what you think. Leave a comment, rate it, and don’t forget to tag a picture #scalingback on Instagram so I can see what you came up with! 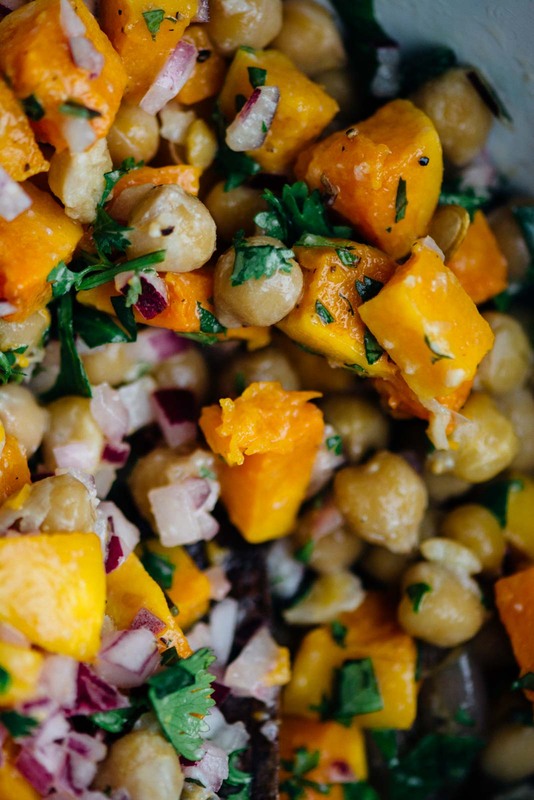 Keep healthy this holiday with this squash and chickpea autumn glow bowl. Topped with a miso-tahini dressing its great hot or cold! 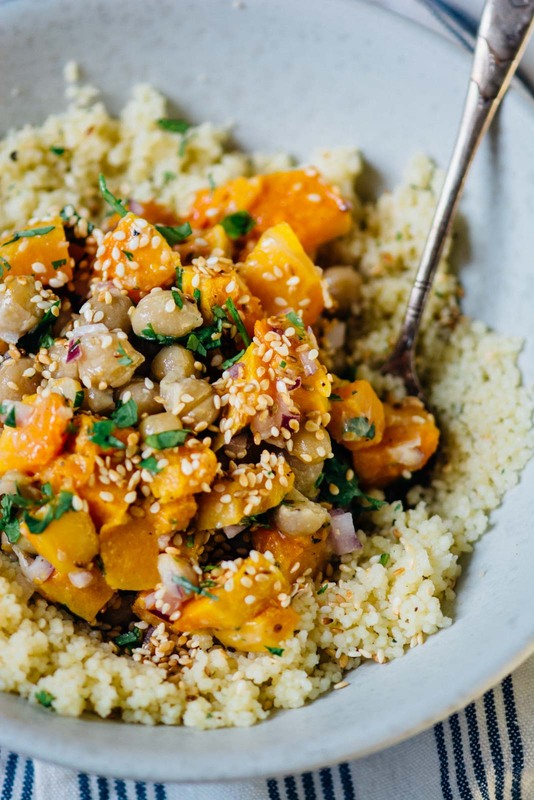 Place the butternut squash on a large baking sheet, toss with the olive oil and season with salt and pepper. Roast for 25-30 minutes until tender. Remove from the oven and let cool slightly. While the potatoes are roasting prepare the dressing. Grate the clove of garlic with a Microplane grater or finely dice, sprinkle with a touch of salt and mash with the back of a spoon until you get a smooth paste. In a small bowl add the garlic along with the lemon juice, tahini and miso and whisk to blend. Add the water and olive oil and season with salt and pepper. You should be able to pour the sauce easily, so add more water as needed to achieve the desired consistency. 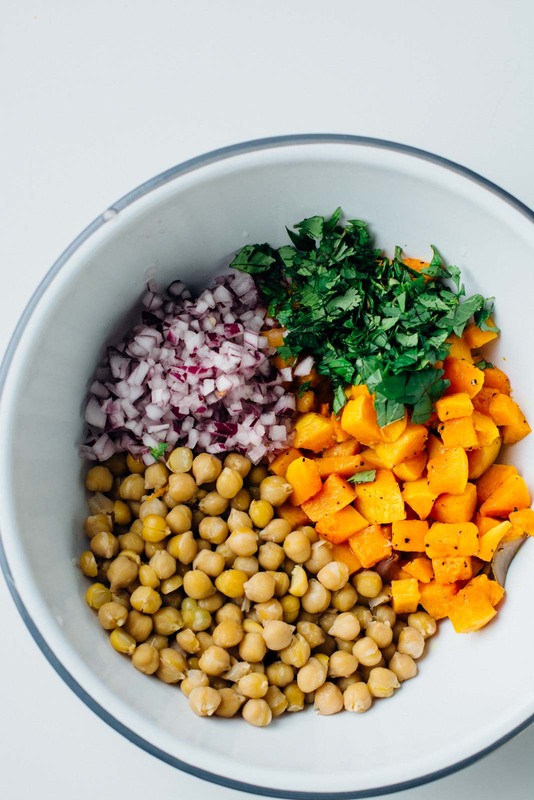 To assemble the salad, combine the sweet potatoes, chickpeas, onion and half the parsley in a mixing bowl. Add the tahini dressing and toss gently to combine. Sprinkle the top with the reserved parsley and sesame seeds and serve. 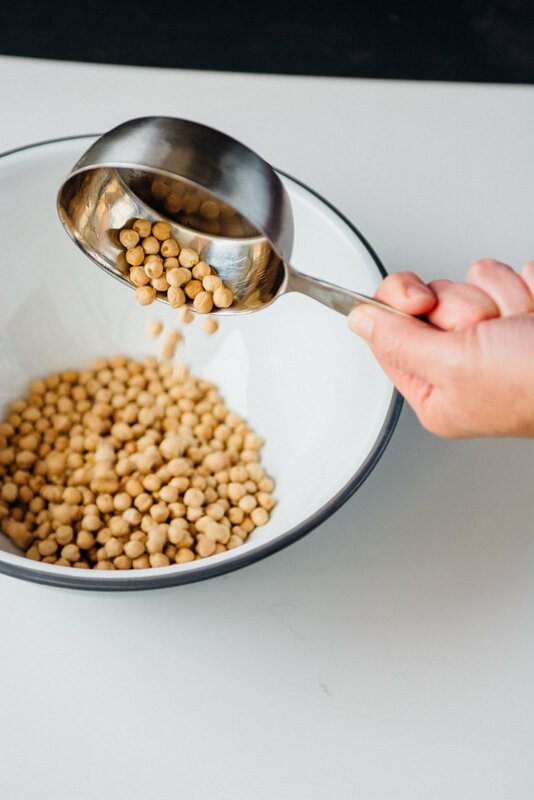 Place the water, chickpeas, and baking soda in a 2½-quart slow cooker. Cover and cook on high heat for 4 hours, or low heat for 8 to 9 hours, or until tender. Add the salt the last hour of cooking. Drain and use immediately or store in the refrigerator for 3-4 days. I am really confused with the recipe. 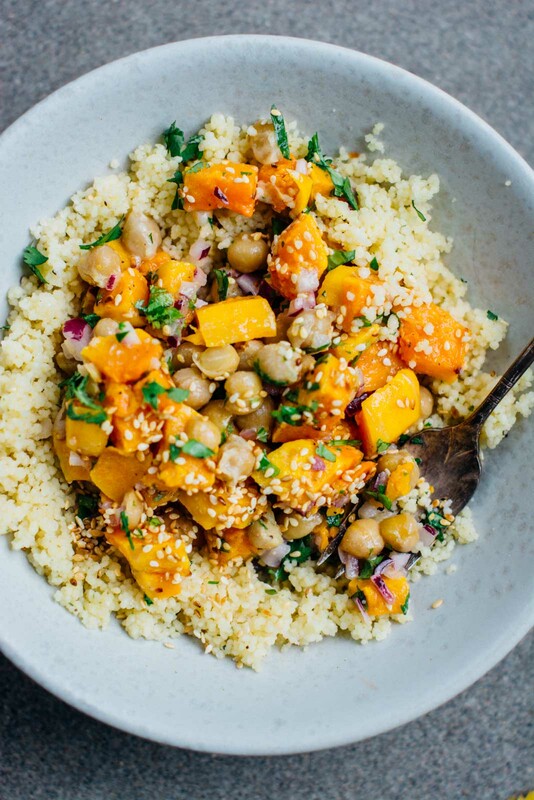 It’s called Squash & Chickpea Autumn bowl, and in the method, it states roasting squash, then it says to grate garlic while sweet potatoes are roasting. 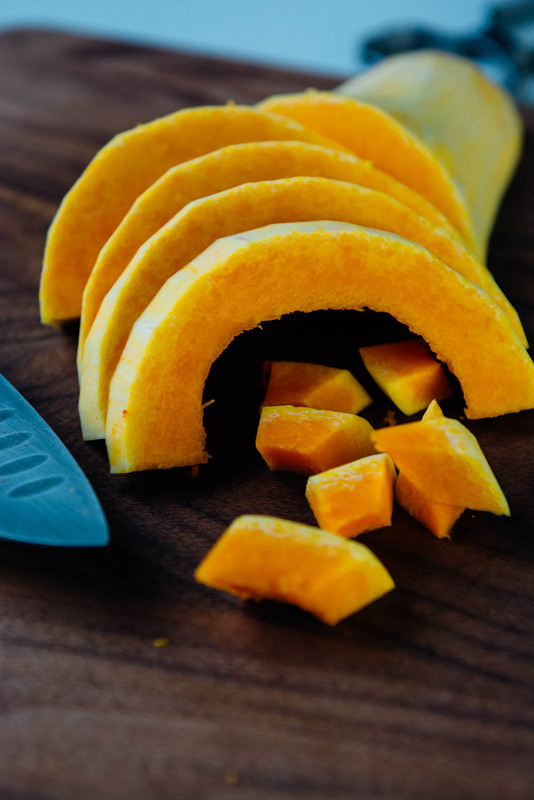 Are you using squash and sweet potatoes, interchangeably? Or, is it sweet potatoes and squash in this recipe? I’m so sorry about the confusion. This is a recipe that I developed years ago for a friends blog and at that time I used sweet potatoes. I did a bad job of re-writing the recipe to reflect all the changes I made. 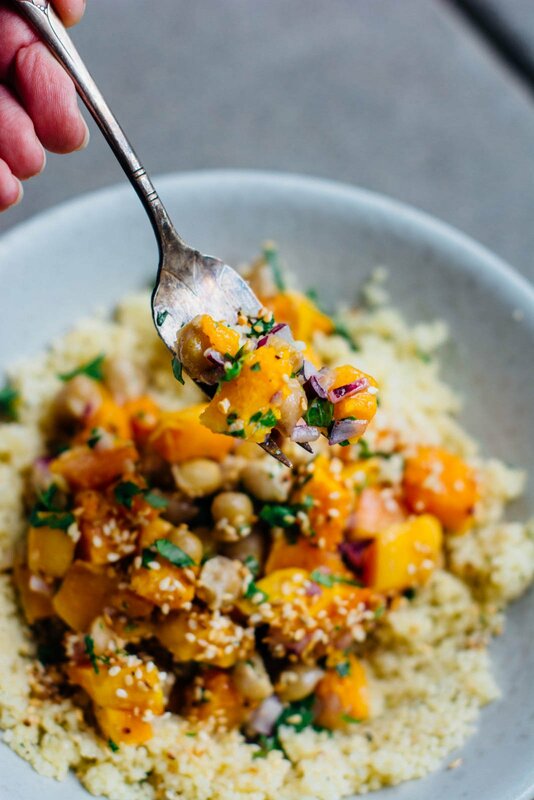 You can use sweet potatoes or any kind of winter squash for this recipe. I’ve made it with both many times depending on what I have in hand and they are both delicious. This is a dish that I make often and it’s always a hit at potlucks and picnics. I hope you like the recipe if you try it and sorry again for the mix-up! Thanks Leah! It’s a recipe I’ve been making for years, super easy and makes great leftovers. I hope everyone is doing well, time is flying by so fast. I can’t believe our boys are in high school!